In MCN this week you can read the exclusive test of the Ducati 999S, the first ride of the Honda CB1300, and our insurance special, which can save you money on insuring your bike. You’ll also find designs for six new Triumphs and news from the first ride of the 500bhp, 300mph four-wheeled Dodge Tomahawk concept bike. There’s also the new Honda track-focused CBR600RR for £3250, and the 1900cc, 240bhp Hayabusa engine from tuning firm TTS. Find out how congestion charging could affect you, and you could win a Honda ANF125 Innova. In this issue, we have the ultimate insurance guide. Seven pages are dedicated to showing you how to get the best deal. We speak to Carole Nash director Warren Dickson and show you how you can save money on your premium. We test the new musclebike from Honda, the CB1300. Our exclusive ride reveals it’s a genuinely exciting bike: Comfortable, surprisingly flickable, with a totally reworked engine. We also test the new Honda ANF125 Innova, probably the most important bike Honda will release this year. As the successor to the best-selling vehicle of all time, the C90 Cub, it needs to be good. You can also become an expert on the BMWR1100RT. Produced from 1995 to 2000, it’s a practical way into touring with a BMW badge, but you’ll need our guide to make sure you know what to look for. We exclusively test the best bike yet in the Ducati range, the 999S. We put it head-to-head with its main rivals, the Aprilia RSV-R Mille and Honda SP-2, to find out how it compares, and what makes it so special. With all the figures, speed testing, acceleration testing and road testing, all three bike are giving a thorough workout to find the king of the V-twins for 2003. The products section features new lids from Arashi, designed by MCN competition winners. Three helmets will go into production based on designs submitted to our competition. Two have been designed by Tim Cox, now a fully-fledged helmet designer, thanks to our life-changing competition. You can also read how Daytona Race boots stand up to use by an MCN road tester, and about the Avoid-It system that will text you when someone tampers with your bike. The What’s On guide lets you know what is happening in your area over the next week, and previews the Scottish Motorcycle Show (March 8-9). The full dates for 2003 MCN track days are also listed, starting with Brands Hatch on Mon April 7, and running through the year until October 22. In sport, we report from the official Ducati Desmosedici launch, and update the progress of the Kawasaki, Suzuki, and Yamaha bikes. We also reveal how Brands Hatch will get £1.7m of improvements, to ease congestion, improve facilities, and change Dingle Dell corner. We talk with new BSB star Yukio Kagayama about gambling, women and the nightlife in Bournemouth. WSB reporter Andy Downes speaks exclusively to Neil Hodgson and gets his tips for title contenders. 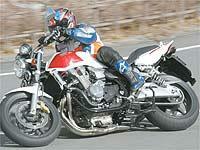 The Off-Road section is a special Donington Supermoto preview. This weekend is the MCN Donington Park Supermoto Race of Champions. We look at the top riders and bikes that will tackle the specially-built 1.5 mile circuit and take a trip around the circuit with David Jeffries as our guide, including going uphill into Goddards the wrong way for turn one. All this and more is in Motor Cycle News, out February 19.